Against ALL Authorities Titan Down! Titan purchases often happen through forums. Smart buyers and sellers often use alts to distract people that want to cause harm to these new titan owners. 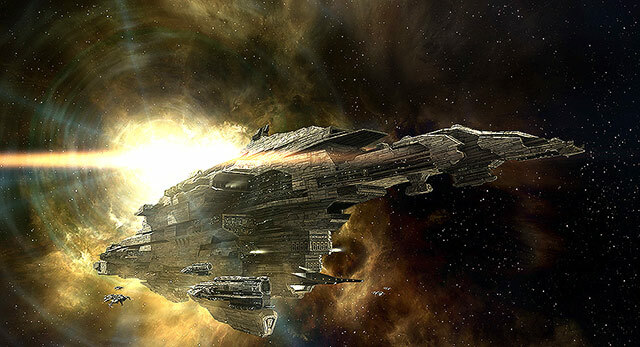 Carinia, a member of Against ALL Authorities didn’t consider this and posted a buy order on a Leviathan on the EVE-Online Forums. Outbreak and Mafia noticed this particular post, and started keeping a close watch on the brand new titan owner. Sure enough, they found the Leviathan in a midpoint on its way to .-A-.’s staging system of GE-8JV, and tackle was quickly rushed down. The titan’s cyno went up in a belt, and tackle was quickly warped to it. The brand new Leviathan, knowing in his head he was done for, panicked and decided that his cloak was his only chance of surviving. Outbreak & Mafia members began to zoom around the belt, and eventually the Leviathan became decloaked. The titan was quickly pinned down by tackle, and the rest of the Outbreak and Mafia fleet jumped in and began putting the hammer down on the tackled Leviathan. The incredible tank of the Leviathan did not break under the Outbreak & Mafia onslaught, so a call went out to Black Legion which quickly formed a Talos fleet, and within minutes put the Leviathan out of its misery. The next time I read a blog, I hope that it won’t disappoint me just as much as this particular one. I mean, I know it was my choice to read through, nonetheless I really thought you would probably have something useful to talk about. All I hear is a bunch of moaning about something you can fix if you weren’t too busy searching for attention. What is your opinion of personal blog sites as well as on-line journaling? I have been reading out some of your stories and it’s pretty nice stuff. I will surely bookmark your blog. zCEjYE Im obliged for your blog. Much many thanks. Keep beginner as guide to.